DOES NOT include the RS-HFIQ 5W Transceiver board. Upgrade kit to turn your existing RS-HFIQ into an IQ32. The IQ32 is 5W output, 80-10M Amateur Radio transceiver with powerful 32 bit processing providing high-end features at an entry level price. The IQ32's 3.2" color LCD touch-screen display and dual control knobs provide an enjoyable operating experience in a robust package. 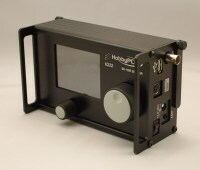 This is an upgrade kit to turn your existing HobbyPCB RS-HFIQ into an IQ32. Download the Assembly Manual for easy to follow instructions on assembly. Introducing the HobbyPCB IQ32 HF transceiver, based on the high performance RS-HFIQ RF system, the receiver in the IQ32 consists of 5 band-pass filters to reject out-of-band signals, an LNA with frequency dependent gain and a conventional quadrature down-converter. The transmitter features a Class A, 5W power amplifier with individual low-pass filters for each band to exceed FCC requirements for spectral purity. The IQ32 features a large, color, touch-screen display providing an enhanced user interface and informative spectrum and waterfall displays found on radios costing much more. With a powerful STM-32 DSP processor, the IQ32 transceiver has variable filtering, multi-mode AGC, memory functions, built-in PSK encode/decode with keyboard support. 5W not enough power? Add a HARDROCK-50 to your station to boost up to 50W. The IQ32 and HARDROCK-50 seamlessly integrate together for a powerful mobile/base station! Simple upgradeable firmware, no connection to a computer required, no drivers, no cables. Simply insert a thumb-drive with the appropriate file and the IQ32 updates its own firmware.